My customer, James, was covered by a family high deductible health plan (HDHP) and enrolled in Medicare when he turned 65 on September 21, 2017. At that time, he dropped his HDHP coverage and his wife, Lisa, switched to a self-only HDHP for the rest of 2017. How much can they contribute to an HSA for 2017? They will have to prorate their HSA contributions for 2017. They are eligible to contribute eight months of a prorated family limit based on having family coverage from January through August. Even though James turned 65 in mid-September, he was not eligible for that month because his Medicare enrollment was effective the first day of the month he turned 65. 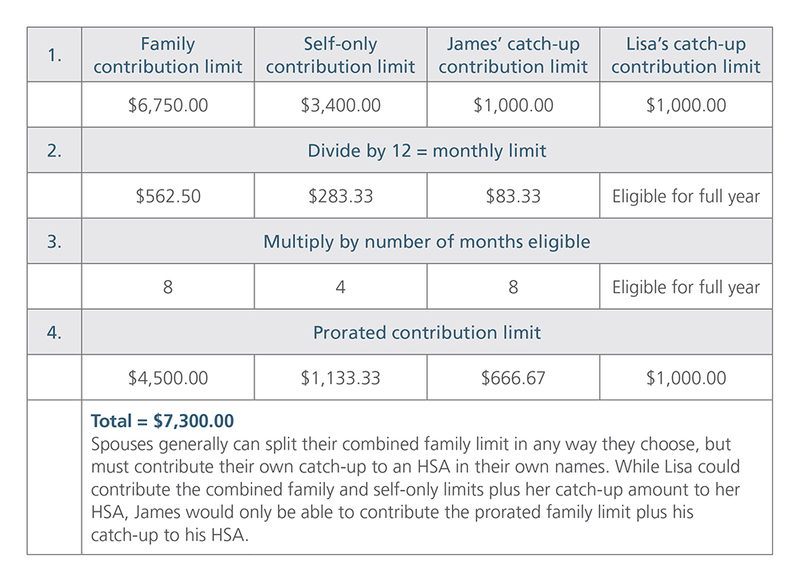 In addition to the prorated family limit, Lisa is eligible to make a prorated contribution for the rest of the year based on her self-only coverage. Because they are both over age 55, they also are eligible for catch-up contributions. James, however, will have to prorate his catch-up amount based on eight months of coverage, while Lisa will be able to make a full catch-up contribution because she had HDHP coverage for the entire year. As shown in the chart below, using the applicable full-year contribution limits, first determine the monthly limit for each category. Then multiply the monthly amount by their applicable months of eligibility for each to come up with their prorated contribution limit. Should James have made his HSA contribution before he enrolled in Medicare? No, it is not necessary to actually make the HSA contribution before Medicare enrollment. James can make the actual contribution until the tax return due date. His enrollment in Medicare only impacts the amount he can contribute for 2017; it does not alter the deadline of the contribution. A 43-year old customer added his spouse and children to his HDHP in May 2017, so his coverage changed from self-only to family. Does he have to prorate his 2017 HSA contribution? He can prorate his 2017 contribution, but he also has the option to make a full-year contribution based on the “last-month rule.” This rule allows an individual who is HSA-eligible on the first day of the last month of the tax year (December 1 for calendar year taxpayers) to make a maximum annual HSA contribution based on the type of HDHP coverage in effect on the first day of that last month. This would mean that your customer who changed from self-only coverage to family coverage during the year could contribute a full family limit because that was the type of coverage he had on December 1. However, if he decides to contribute the family limit, he is required to remain HSA-eligible through a 13-month testing period. His testing period would be from December 1, 2017, until December 31, 2018. If he loses family HDHP coverage during that time, the portion of his contribution over the sum of his monthly limits would become ineligible and he would be required to include that amount in his gross income and pay a 10 percent additional penalty tax.